It’s a strange feeling to lie to your mother or father when you are their caregiver; not unlike when you were a child learning right from wrong. It can be a gift, however, when your loved one has dementia. This is called “therapeutic fibbing,” or, as the Aging Life Care Association calls it – a “fiblet.” In the association’s e-book put together by Jullie Gray, “Is It OK to Lie to Your Aging Parents,” 90 percent of Aging Life Care experts recommend the use of fiblets as a way to ease anxiety and protect the self-esteem of loved ones with dementia. Men in particular often have trouble accepting the help of a caregiver, whether a professional or family member. Sometimes it is easier to say the caregiver is there to take care of the wife and to keep her company. Driving is a huge issue in terms of safety and it is perfectly okay to say the car is in the shop being repaired. In fact, you can say that every day, or a dozen times a day, and get away with it. Even in the hospital, a family member or caregiver is better equipped to communicate with the patient than a doctor who is not familiar with the benefits of the fiblet. Patricia Williams, caregiver to both her parents and author of While They’re Still Here, A Memoir, gives an example of how medical professionals may be completely unaware of the therapeutic fib. In her book, she describes trying to intercept her father’s cardiologist in the hospital before he reveals all the risks associated with his heart condition. Williams suggests to the surgeon that he let her explain the situation, knowing that her father would break down at the news that he was not a candidate for heart bypass and could only have a stent, which was a temporary solution. The doctor went ahead and announced his news, causing her father to burst into tears and sob “Is this it?” As the doctor mouthed he was sorry to Williams, she stepped in and turned the bad news into good news, reframing it in a way that was positive and less scary, which calmed her father down. All this intentional rearranging of fact can sometimes be frustrating, and just plain exhausting, for the caregiver, who has to remember to moderate his or her response to the needs of the client, or loved one. That’s when it is important for the caregiver to take a break. Perhaps it is an emotional dilemma for the daughter of a loved one to have to continue to refer to a parent she misses and knows is dead as if he or she is living. 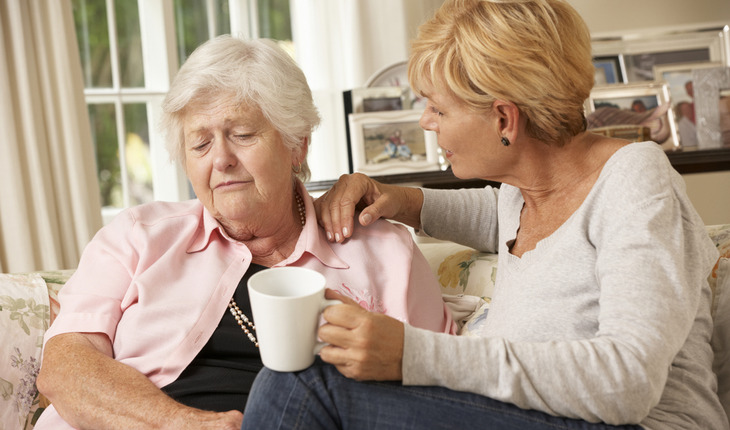 Iris Waichler, a licensed clinical social worker and patient advocate for 40 years, and author of the award-winning book, Role Reversal: How to Take Care of Yourself and Your Aging Parents, notes that being a caregiver and trying to give the best, most comforting response can be emotionally draining. Sometimes it is better to drop a subject or take a time out and give yourself a few minutes to get grounded or calm down. And be sure and go to your own doctor appointments and schedule some time away. Your loved one is not the only person who deserves compassion.